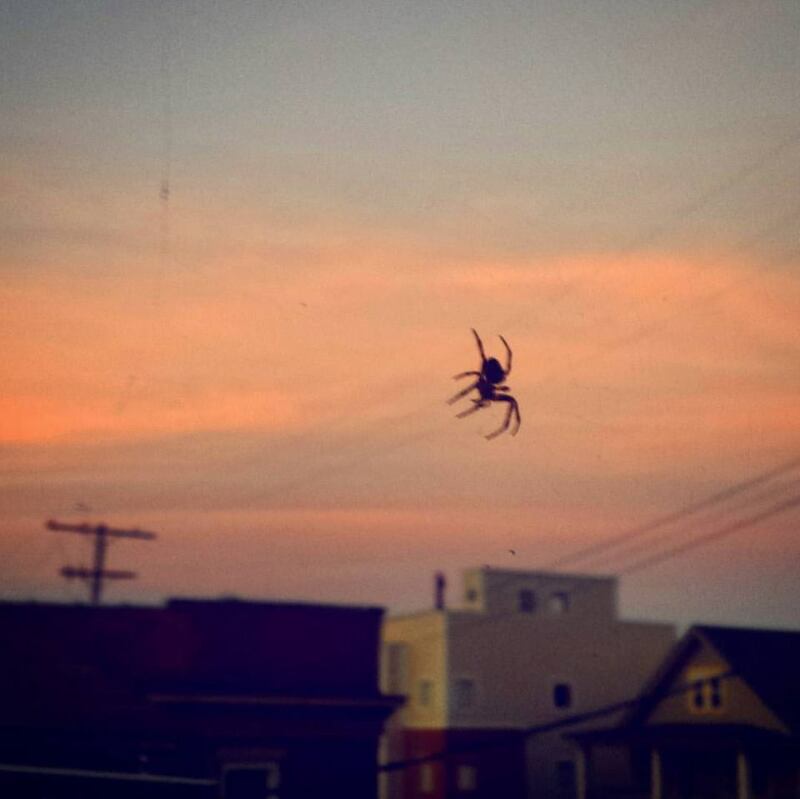 Giant Killer Spider descending from the evening sky into my neighborhood (except, not really). Maybe you’ve heard of the 1972 novelty (not-quite-a) hit, “The Cockroach that Ate Cincinnati” by Rose & the Arrangement. It’s basically what you’d expect from a 1970s novelty song. 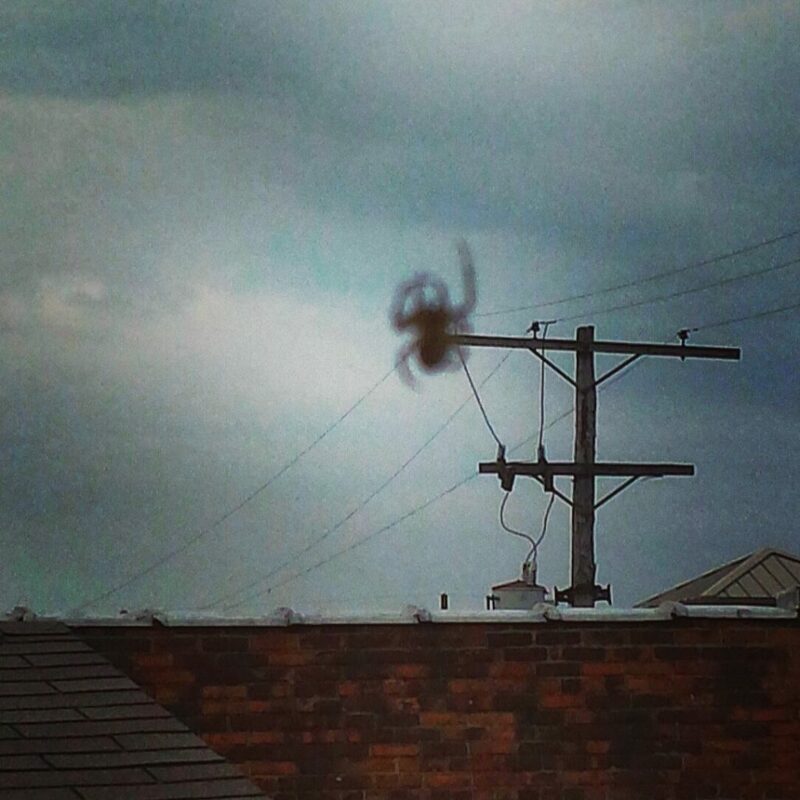 In the same spirit here’s the Spider that Ate Cleveland … or at least my neighbor’s house … or at least it looks that way. Entertainingly enough this particular visitor presented me with several decent photo opportunities. While I was trying to capture the intricacy of the crafty web with the spider in the center of the frame, I noticed instead I was getting some great forced-perspective shots that made the spider look fairly enormous. I wish the picture with the spider seemingly descending from the sky onto a telephone pole was sharper, but that kind of adds to the mystery. That was taken on Wednesday night. 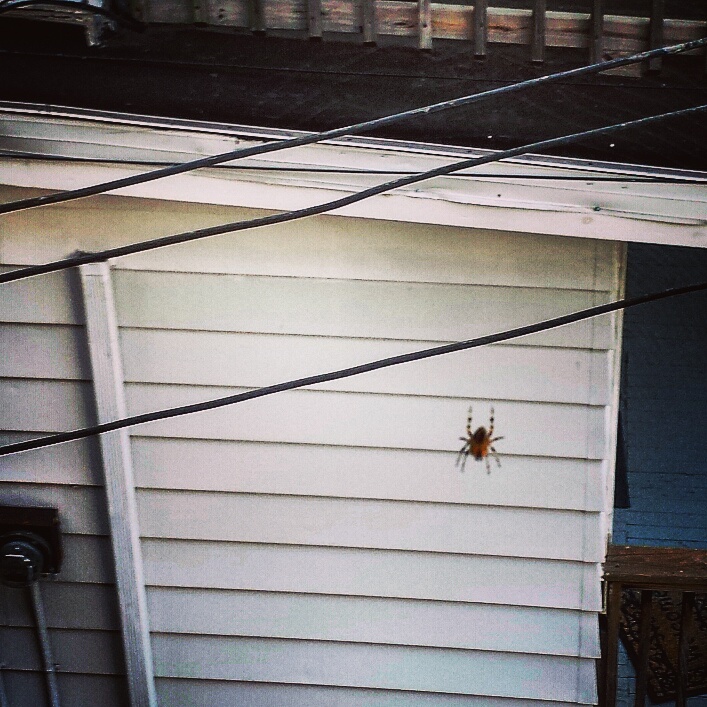 The picture of the same spider seemingly scaling the side of my neighbor’s home was taken last night. Again – while trying to capture the web, I ended up instead with a fairly nifty shot that makes it look like my neighbors and their cats could be in grave danger. But you needn’t worry for them or their felines. Both shots were taken from my porch of my porch. The invisibility of the web helps with the Hollywood-esque effect of shooting something in forced perspective to make the spider look further way from me when in reality, I was practically on top of it (begging it to stand still for just a sec). As of this morning (the pic below was taken last night) my spider friend continues to build, build, build.